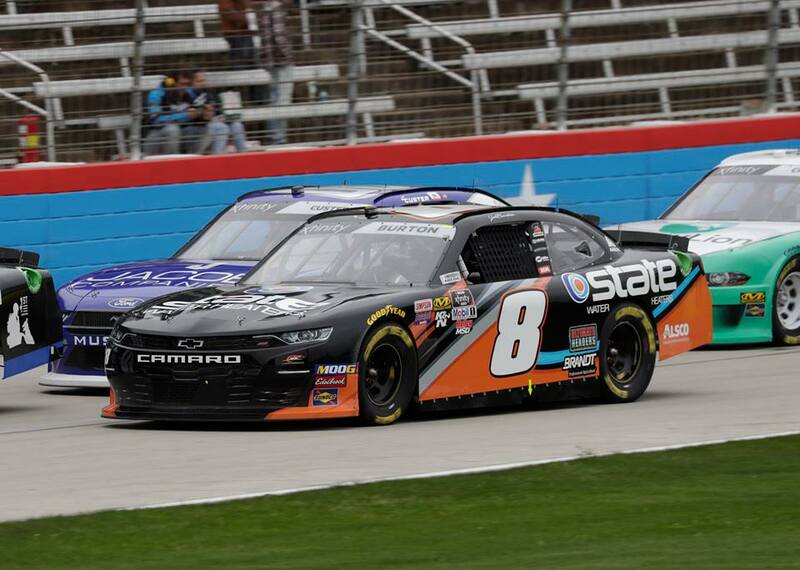 Jeb Burton and the State Water Heaters team brought home a fifth-place finish in the My Bariatric Solutions 300 on Saturday afternoon at Texas Motor Speedway. The finish is the No. 8 team’s second top five of the 2019 NASCAR Xfinity Series season and is also Burton’s second-best career NXS finish following a fourth-place run at Daytona in 2017. After advancing into the final round of qualifying in Fort Worth, Burton rolled off the grid for the 300-mile event in sixth place. On lap 3, the caution flag was displayed and the 26-year-old driver was able to relay to his team that the handling of his No. 8 Chevrolet was too tight through the center of Turns 1 and 2. Following the quick caution, the track remained green, leaving Burton to drive through the tough-handling condition until the team was able to make adjustments following the stage end. With no changes able to be made, the State Water Heaters team finished Stage One in the 14th position. A quick stop under the stage-ending caution for fresh tires, fuel and an adjustment put the No. 8 team in 11th place for the start of Stage Two. With adjustments being made in the right direction, the Virginia native was able to race his way into the top five by lap 56. Electing to stay out under the lap-59 and lap-66 cautions, Burton held onto his top-six track position. In the closing lap of Stage Two, the yellow flag returned giving the State Water Heaters team the opportunity to make a strategy call. Crew chief Taylor Moyer brought Burton down pit road for four tires, fuel and another small change. The No. 8 team took the final restart of the stage in 11th after other teams opted to stay out. When the stage concluded, Burton had advanced four positions into seventh. With their recent pit stop prior to the stage end, the State Water Heaters team remained on track following the green-and-white checkered flag, taking the restart for the final stage of the race in the fifth position. The further improved handling of the No. 8 Chevrolet allowed Burton to drive into fourth and begin logging his fastest laps of the race. As the long run continued, the handling of Burton’s Chevrolet began to grow tight. On lap 127, the caution flag waved giving the team the opportunity to once again make changes to their Camaro’s handling. The State Water Heaters team restarted in seventh and found themselves back up in fourth place when the yellow flag once again returned within just two laps. Following the restart, the JR Motorsports driver remained quiet and focused throughout the closing laps of the race until a late-race caution came with 10 laps to go. On the restart, Burton was the first car with four fresh tires as others elected for opposite strategies. In the final laps, the State Water Heaters team advanced one additional position to claim a fifth-place finish. Kyle Busch won the cowboy hat in the NXS event and was followed by Tyler Reddick, Christopher Bell, Chase Briscoe and Burton to round out the top five.